There are numerous ways of preparing tea. 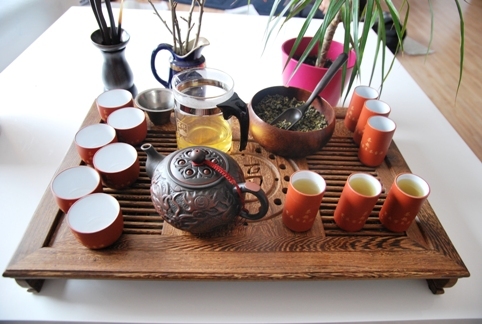 While Westerners in the past were tendentiously limited to pouring hot water over tea leaves in a way as time- and effort-saving as possible, and have the result in either the same vessel or in a separate cup, the most classic, ritualistic and solemnly beautiful form of tea preparation now increasingly gains popularity in the US and Europe as well. The following video illustrates the preparation of Oolong tea (here the Oolong Nr. 17) in a variant of the Chinese tea ceremony as it is practiced by our Northern Thai suppliers. 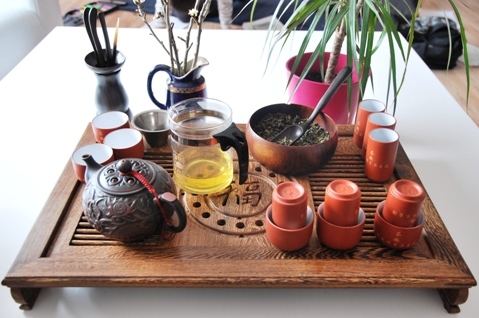 The tea ceremony has its origins in China, the country that is quite the cradle of all tea culture. While Japan developed its own, more strict and more hierarchical tea ceremony based on this, we’d like to put our emphasis on the rather highly individual Chinese tea ceremony, since it matches best with our Northern Thai Oolong, Green and Black Teas, all of which look back on roots stretching via Taiwan back into the old China. 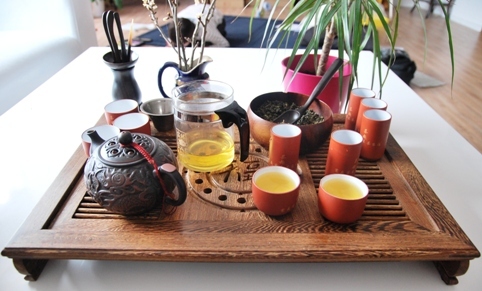 One could say, the Chinese tea ceremony is a mixture of ritual framework, situational cirumstances and individual arrangement/personal discretion. 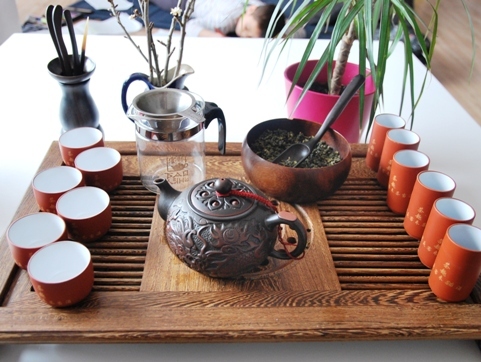 The “2-pots-method” shown in the video, as it is common in China or Taiwan, or also for the ethnic Chinese groups in Northern Thailand, is neither the absolute only nor the absolute best form of the Chineses tea ceremony. If it comes to the ritual of preparation, different tea masters rather have their individudal preferences for each kind of tea, and in turn, these preferences are adjusted to the given circumstances, i.e. the tools and facilities available, the situational context and the actual predominating mood. Purpose of the tea ceremony is to achieve the best possible taste of the tea, the realization of the highest possible degree of beauty in the ritual’s arrangement, and a social or individual situation of utmost harmony, in other words: the perfect moment in space and time. In order to develop an understanding for this form of perfection it is important to imagine the harmonious interplay of the five core elements in Chinese philosophy, wood, fire, earth, metal and water as water as in a permanent condition of free flow motion. While the representations of wood, earth, fire and water in the tea ceremony are rather obvious, the metaphoric presence of the element metal and its properties, at times metaphoric, also reveals itself at closer observation. A similarly suitable descriptive concept, from another perspective, would be that of the three Taoist elements sky-human-earth. Besides the Taoist ones, Confucian and Buddhist influences, references and analogies can be found in the Chinese tea ceremony. Also the image of the “way” or “path” that has no beginning and no end, but nevertheless IS, as a metapher for the life or being in general, can easily be identified in the tea ceremony. All these approaches have the free flowing, perfect interplay of several basic elements that form a holistic oneness in common. 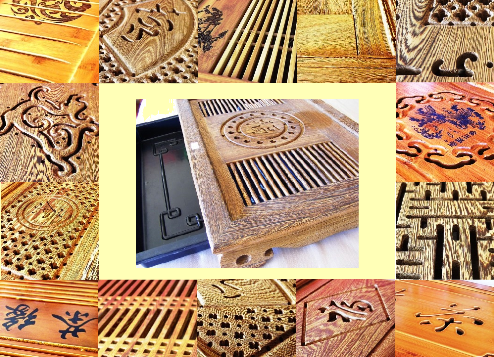 As can be seen in the video, the ritual preparation of tea does not only require much skill, practice and focusing, but also a quite extensive range of “tools/facilities/accesssories”. In the following, we’d like to introduce these tools and illuminate their respective functions and roles. 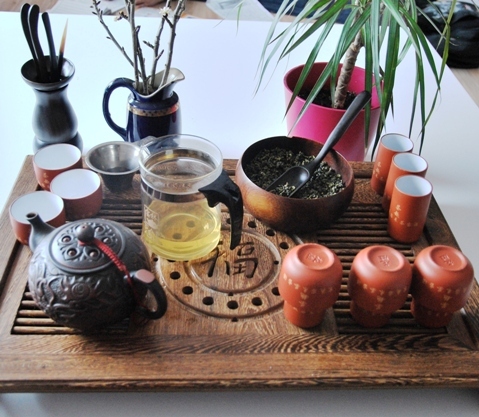 They are combined based on availability, tea specimen and individual preference, whereas apart from the basic action of pouring hot water on tea leaves and drinking the tea after some infusion time, the single steps of the ceremony as well as the choice of accessories used in it can be omitted, added or even changed in sequence. The tea boat is more than just a platform in the spatial center of the tea ceremony, on which the major part of the actions performed in the ritual’s context takes place, also represents the element wood and serves as a work of art, an ornament and a piece of furniture. It is the only static element in the middle of the (flow) motion that is characteristic for the tea ceremony and of which all other used items and materials are an integral part. Tea boats are mostly made out of wood or bamboo and often include an integrated pull-out trough for collecting the water and the tea poured over teapots and teacups in the course of the ceremony in order to supply them with the warmth and fragrance of the tea to prepared. Apart from such functional requirements, the design of a tea boat is very much left to its makers creativity: There are rectangular tea boats, such with round shapes and mixes of both forms. There are boats in all sizes, such with predestined areas for cups, teapots and other accessories used in the ceremony and such without. Pouring Behavior: Does the pot pour drop-free, steadily, to the spot even from larger distance, not too slowly, but also not too fast? Outflow Path: Is the interior opening to the muzzle located close to the pot’s bottom (optimally), rather on median level (suboptimal) or even in the upper half of the teapot (not good)? Does the pot have a worked in inner sieve or not? If so, will this obstruct the outflow at pouring with congesting tea leaves or not, and: do tea leaves or leaf parts get into the beak, where there either get stuck and block the outflow or flow on right into your tea? Material Properties: While principally a variety of different materials is suitable for teapots (tone, ceramics, porcelain, glass), the exact consistence of the material influences the characteristics of the teapot and ultimately the taste of tea prepared in it. While for example too porous tone or ceramics tea pots partially absorb the flavor of the tea, thereby depriving the consumer of it, a completely smooth and impenetrable inner surface omits the desirable effect of permeating the tea pot with the flavor and fragrance of the tea designated for it in the course of long term use. Tea lovers, who can afford it, often use a dedicated tea pot for each of their favorite teas. 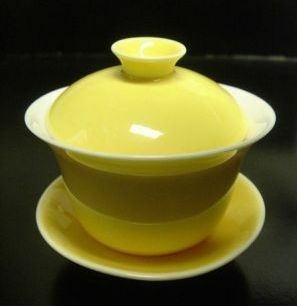 Even tea lovers, who might not be able to afford that or consider it as exaggerated will often use a special tea pot for a certain category of tea, such as Oolong teas. The durability of the pot is a question of the material quality as well: will the pot break from merely looking at it too hard or will it even survive the occasional accidental collision with another or a too firm placement of the tea pot back on the table/tea boat? 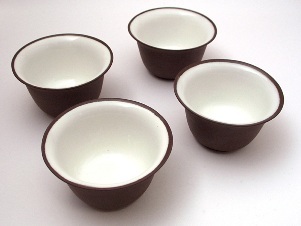 Material: Especially for our Oolong teas, we recommend the use of tone or ceramics pots as are preferably used for such teas in Chinese and Taiwanese tea tradition. These can also be used for Green and Black Teas, however, which teapot to use for which tea is ultimately a question of individual preference. So, I personally tend to prepare Green Tea in a glass pot and I know of friends, who principally use a porcelain pot for Black Tea. Craftsmanship Also, the quality of craftsmanship of a teapot is not without significance for its qualification. Correctly intended, but inappropriately implemented functionality in the end leads to defects in single or several of the above-mentioned factors and thereby impairs the overall quality of the teapot. Indeed, tea pots should be crafted by tea drinkers, as only tea drinkers are aware of all requirement criteria and will try to appropriately accommodate them. The optimally crafted teapot is therefore naturally produced by a person, who is both a master of the craft and a tea lover and connaisseur. Aesthetics: This aspect is, of course, a highly individual one that of varies from person to person within a wide spectrum. Nevertheless, the proper preparation of tea, especially in its arrangement as a tea ceremony, mandates harmony as one of its uppermost principles. Therefore the used utensils should fit each other, i.e. harmonize aesthetically. 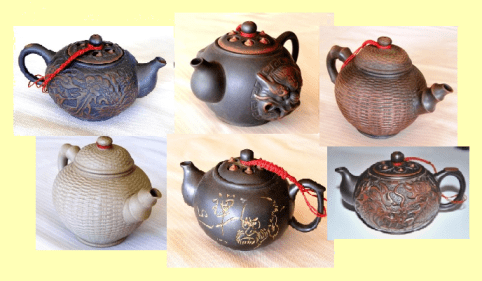 The teapot is in the tea preparation/tea ceremony’s center and therefore represents a focal point in it that other accessories used are compared with. However, it needs to be emphasized that also in regard to achieving harmony the individual is the measure of all things, that is what counts is the harmony perceived by the actor and not the harmonious criteria of a third instance (such as the social mainstream, a claim of exclusiveness by a certain culture/institution, …). First of all, all that was said about tea pots also applies to the teacup in the applicable extent (in regard to material, consistency, craftsmanship, aesthetics): it should be of good quality and craftsmanship, of a material appropriate for the tea that is prepared, and aesthecically fitting with the teapots and other utensils used in the ceremony. 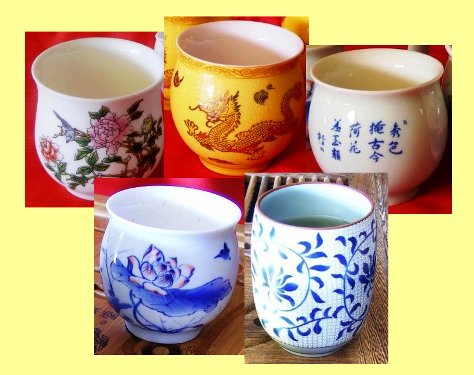 Naturally, there’s an indefinite variety of types and designs of teacups, with and without handle, white or nature or colored, with or without pattern/picture, Western or Asian, etc. The choice is subject to personal preferences and should take orientation at harmonizing with the remaining utensils employed. The tea ceremony usually does not simply aim at a mere drinking, but rather a savouring of tea, which regualarly involves the degustation of several infusions of a tea or sometimes even more than one tea. 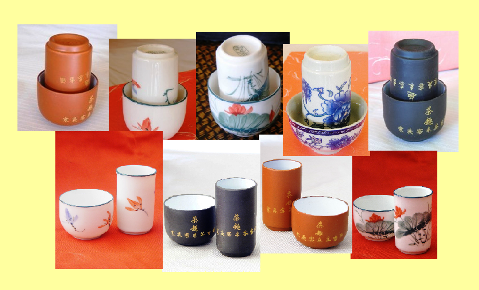 To this end, often little tea cups that are very small compared with Western standards are used instead of “fully grown” ones in the tea ceremony. For the first infusion of a tea (especially an Oolong tea), also called the “infusion of the good smell”, a scent cup or snifter cup cup goes along with the little drinking cup. The tea is initially into the scent cup and then from there into the drinking cup. The empty aroma cup is then lifted and held under one’s nose to take in the aromatic fragrance of the tea. To intensify the smell emitted by the snifter cup, it is often “pre-scented” by beeing poured over and filled with tea prior to the final fill that is transferred to the drinking cup. Drinking cup and scent cup are usually available as complementary aroma cup sets. There’s another version of the Chinese tea preparation method / tea ceremony, where a so-called Gaiwan, a bowl with a saucer and a cover is used to prepare tea instead of teapot and aroma cup set. The Gaiwan combines some of the core characteristics and functions of teapot and teacup in a single “device”. The tea leaves are poured over with hot water directly in the Gaiwan, which is then, after infusion, used to drink the tea from as well. In China and Taiwan, a very common style is to always empty the Gaiwan only about half and then refill hot water. The Gaiwan method promises uninterrupted tea enjoyment without waiting periods, but inevitably produces different taste results as the 2-pots method, where the tea is infused in one pot and then transfered to another tea pot that serves as a serving pot. Also, the Gaiwan method omits several “processing” steps that are integral components of the 2-pots method This way, the Gaiwan on the one hand enables a simplified preparation that can be carried out relatively quick and comparably location-independent with little accessories, while on the other hand, there will be tea lovers, who will miss parts of the procedure that are crucial for them. There are other “devices” that enable a quick and effortless preparation of tea at any given place or circumstances, as the tea mug with a lid and an insert depicted on the photo below shows. Also here, several steps of the tea preparation are united in a single instrument. Though this device might have difficulties to conquer the hearts of those who embrace the complex ritual, it yet enables the preparation of a tea with little accessories in short time and at any place. Certainly this mug will be absolutely appropriate for the preparation of fruit teas or herbal teas. Meant isn’t a drinking bowl, which is also sometimes referred to as tea bowl, but a mostly wooden bowl that serves to arrange the dry tea leaves on the tea boat and/or on the table, where the tea ceremony will be performed. Of course, also this is not a must. Often, simply the tea package itself is placed instead. The decision in favor of or against the tea bowl or tea package is always mainly an aesthetical one or even a question of whether or not you want to show the tea package, which usually will bear information on the used tea and its supplier, for information purposes or simply out of pride to the attendees. Shown on the above photo are several typical instruments commonly used with the tea ceremony that will, at least partially, proof useful for less ritual or elaborate forms of tea preparation just as well: Tea scoop, tea tongs, tea needle and tea spatula as well as a tea sieve. The tea scoop is used to portion the tea leaves, often available in rolled form, from the arrangement bowl into the tea pot. If the tea is present in form of open leaves, the tea scoop is rather not suitable for the portioning and the tea spatula is used instead to push the the tea leaves from the bowl into the teapot. The tea tongs serve for grasping, lifting and moving of the small drinking and snifter cups and also the teapot’s cover, since these parts can heat up through the hot water in a way that doesn’t allow for touching with the bare fingers anymore. Using the tea tongs is not only a method that requires much skill and practice, its exercise will most probably at times produce shards… the tea needle is for clearing the teapot’s muzzle of possible stuck tea leaves. 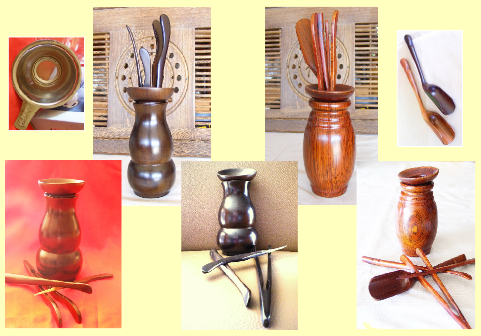 These utensils are often accommodated as a set in a utensil holder being placed near the tea boat/tea table. The purpose of the tea sieve is obvious: although many tea lovers have no problem with small parts of tea leaves swimming in their tea cup or might even consider this an integral part, others will prefer their tea clear and free of leave residues. The sieve often integrated at the inner opening the the teapot’s beak is usually very coarse to prevent it from getting bocked by tea leaves too easy. However, there are pots that are equipped with a sieve insert, as is the case with many glass tea pots, thereby making the use of an additional sieve redundant. Sieve inserts are, however, often quite coarse, so using an additional external sieve will achieve an extra effect. Not depicted here is another instrument that tea masters can use to remove drops of water/tea from the teapot. This way, lime residues as otherwise easily emerging especially with the use of hard water are prevented. To facilitate the filling of the pot with tea leaves, a tea funnel is often used to prevent the leaves to miss the opening. Many tea drinkers preferably use a glass pot as their serving pot, due to the benefit of the clear visibility of the tea liquor and its color. However, a glass pot doesn not only show the color of the tea clearly, it also represents an aesthetical enrichment of the ceremony. Moreover, glass pots offer the advantage of a simple and residue-free cleaning. 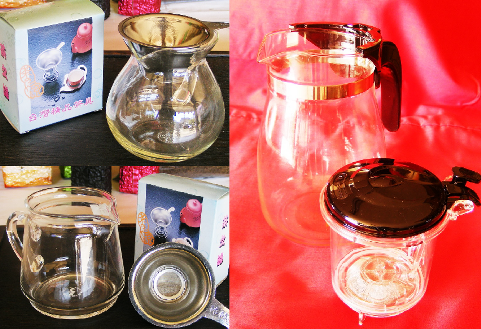 The glass pot/device shown to the right in the picture is once again an “idler” for the simplified tea preparation. While its glass pot component can be used as a normal glass pot in the 2-pots variant as well, the removeable insert makes the combination a real gadget: pushing one button opens the lid for filling in tea leaves and/or for taking out the wet leaves, while pushing another button causes the tea to run down into the pot through a “ball sleuce” at the bottom of the insert. Except for cases of time pressure or in absence of more suitable equipment, I wouldn’t use this device for preparing Green, Black or Oolong Teas. However it has proven a valuable tool with herbal or fruit teas such as Jiaogulan or Safflower tea in our household. 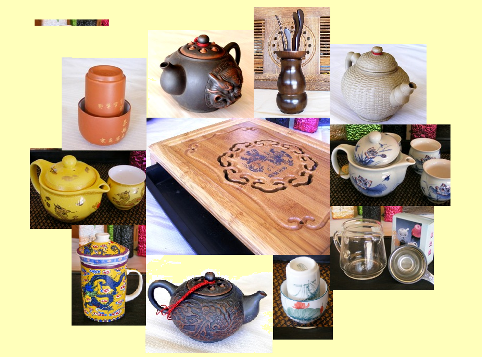 Most of the instruments and utensils shown in the above illustrations will shortly be available at Siam Tea Shop under www.siam-tee.de at very reasonable prices and in selected quality. Not depending on whether you simply prepare tea in an everyday setting tea or pursue the higher ambition of learning the tea ceremony, a good preparation is not only an essential prerequisite for the smooth flow of the preparation/ceremony, but rather already an integral component thereof. You not only prepare the place of the performance, (clean table/area, free of disturbing objects), place your tea boat and organize all needed items and instruments on and around the same, but during these procedures already adopt the appropriate attitude and by irradiating the same create the intended mood and harmony in your environment. Although there is guidelines for the individual main categories of tea (Green Tea: from 70°C, Oolong Teas around 80°C, Black Tea from 90° C), these can ultimately serve only as an orientation basis for the practical determination of the optimal infusion temperature of a tea. Most manufacturers provide relevant recommendations on their packages, but these are not to be mistaken as dogmas, but rather as a starting point for the exploration of one’s own preference. Initially, the tea master moistens the vessels to be used in the tea preparation/ceremony with the correctly tempered hot water. To this end, he/she first pours over and fills the teapot, then he/she will pour the water from this over and into the serving pot and from this over and into the degustation and aroma tea cups. With the remainder, the closed teapot is poured over then once more. The obvious reason for this is to pre-warm the vessels, so the tea prepared in them will not lose its temperature too quick. Another, subtler aspect, especially with the use of porous materials such as tone or ceramics, is to let the vessel “breathe” the water, that is to create a flow or fluent transition between water and material. Now the tea leaves are given into the teapot. This can be done by hand, but it will be more elegant to use the tea scoop or the tea funnel. A universally applicable or even mandatory “dosage guideline” does not exist: The sort of tea used as well as the situation and, based on this, the intended taste and effect result are factors that can influence the used quantity. Sometimes covering the bottom of the teapot is mentioned as a rule of thumb, however, this method would result in significantly differing amounts for different teapot designs and different tea leave forms (e.g. rolled or open leaves). The dosage of a tea therefore will finally be done either according to the tea master’s experience with a tea, or intuitively in case of degustation of teas previously unknown to the tea master. Once this is done, the tea leaves are poured over with water for the first time. In China, this infusion is referred to as the “washing of the tea”, or sometimes as the “infusion for the enemy”. At this, the teapot is filled with water only partially (leaves well covered) and the infusion poured into the serving pot already after a few seconds. From this, one initially pours a little tea over the closed pot to “nurture” the teapot with the tea’s fragrance and aroma. The tea remaining in the serving pot is disposed. Now follows the first actual infusion, also named by the Chinese as the “infusion of the good smell”. The infusion period depends on the tea used, the desired taste result and the number of infusions intended for the preparation/ceremony. While Chinese tea masters often begin with very short infusion times, starting from no longer than 15 seconds to max. a minute, tea lovers in everyday Western life rather tend to infusion times between 2 and 5 minutes, based on tea, individual preference and situational influx. In the Chinese tea ceremony, this infusion is first filled into the aroma tea cups, after completely emptying the water stil present therein (mostly using the tea tongs). Then, the drinking cups are put upside down over the scent cups and the newly established unity of scent and degustation cup served to the attendees. Using the tea tongs at this requires much skill and practice. It is an art that will reveal the practiced hand even to the untrained eye. After every participant of the ceremony has been served, the combination is turned upside down with a courageous momentum so that the tea is now in the drinking cup. Now the snifter cup is guided to the nose and the tea’s scent initially taken in via the olfactory sense. This is followed by the tea’s oral degustation from the drinking cup, in compliance with the Chinese tradition in 3 sips, one for the earth, one for the sky and one for the human. 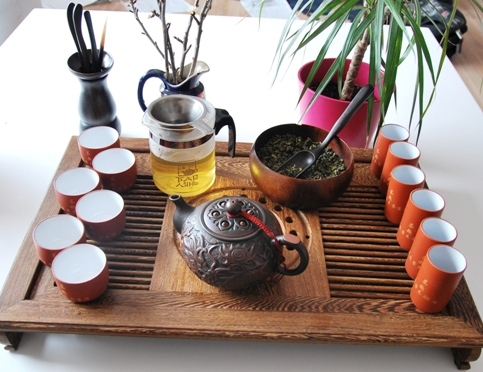 In the Chinese tea ceremony, the second infusion is considered the “infusion of the good taste”. This is certainly true for this form of tea preparation, with the very short first infusion period. Rolled tea leaves will usually need some time for the granules or rolls to open in the hot water and will therefore release their flavor only limitedly to the first infusion. All of this naturally doesn’t apply to a domestic tea preparation according to western standards, where the first infusion, as described above, will usually be left to infuse for longer periods ín order to obtain a more intensive and less subtle taste experience. Nevertheless, also here the second infusion of a good tea will certainly taste just as good as the first one, even though a little different. The infusions following the infusion of the good smell are poured out only into the drinking cups, while the scent cups are omitted after that infusion. The tea lover referred to in above statement, who will leave his/her first infusion for 2 minutes or more, will naturally hardly obtain more than 3-5 infusions out of his/her Oolong tea, while the tea master will achieve more than 10 infusions with the same tea, each of which will have its very own characteristics. As we have seen, not only the preparation of tea in everyday life, but also the Chinese Tea Ceremony can assume a broad variety of forms, each of which consisting of its own purposeful combination and sequence of different elements and instruments out of a rich treasure of available options. There is no rule for our selection of which one th chouse for ourselves, when, and for which tea. The variation of tea preparation or tea ceremony practiced by an individual is based on a is based on a fluent recombination of experience values, personal preferences and situational facts. What all ‘correct’ types of tea preparation have in common is that achieving the goal, namely the preparation of an optimal, delicious tea, the flow harmony of the whole procedure and finally the creation of the perfect moment, is in the focus of the actor’s attention.